The silver lining appears once again. This time there is a commentary floating around that the 20% downward revision for GDP (2.5% to 2.0%) was primarily due to weak inventories. Okay, that appears to be true. So far, so good. But, the follow up to that is hope that for next quarter, as sales pick up – inventories will need to be replenished and the cycle will push up next quarter’s GDP number. Furthermore, there has been talk from our ever-hopeful CNBC crew that the inventory-to-sales ratio has been tight and they state that this is more proof that there will be the need to replenish inventories after shoppers are out in full force over the holidays. Maybe they are right. So far there has been an extraordinary level of personal consumption that is holding up even in with the fact that sentiment is low…really low. However, there has been a drastic number of folks that have now exhausted their extended unemployment benefits and the wealth effect brought to us through easy money policy related stock gains has been tempered. 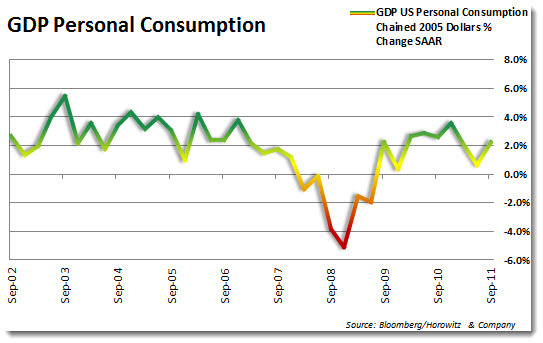 In addition, the global outlook has become much more clouded and consumers may begin to pull back. Hey – here is a thought: Perhaps what is occurring is actually a sign of lower demand seen by establishments that are cutting inventory levels in response. 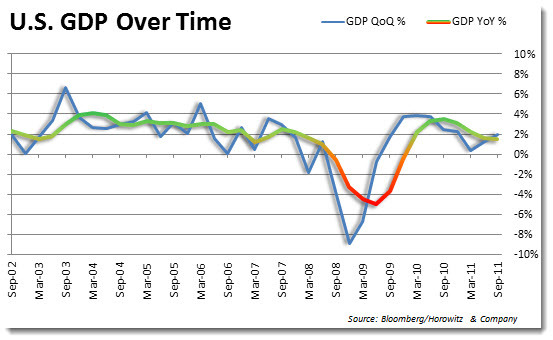 The latest GDP numbers show a drastic drop in all categories for the latest quarter. Government spending is non-existent as municipalities are struggling. 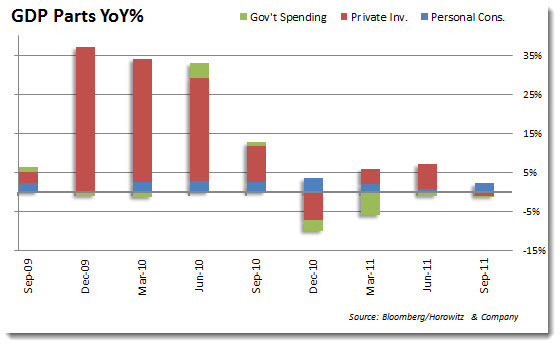 Private investment has pulled back into the negative level and looking closely, personal consumption growth has stalled. The chart above shows year-over-year percent changes of these components is at the lowest point since 2009. With the sharp drop in GDP during the 2007-2008 recessionary period, we should have been registering GDP in the 5%-6% range by now. What is said to be a silver lining may be nothing more than the eternal hope of economists that are always looked for the good in a report, no matter how bad the number may be. From my perspective, the best economists are those that tell it like it is. We need to know what is going on now and the potential for the future – without the benefit of colored glasses..
Facts please, just the facts. From now on, if all of you TV “personalities” could kindly hold back from your government-sponsored/carrot-dangling messages, it will be most appreciated. Next quarter, if/when you realize that you have it wrong, please try not to blurt out that next quarter looks to be better because this quarter’s miss will be made up with additional manufacturing or production requirements. Much thanks!